Two new heroes have been announced for Dota 2: Grimstroke and Mars. While there's not yet much known about the latter other than they're coming later this year "ready for war", Grimstroke is playable now courtesy of the latest update. 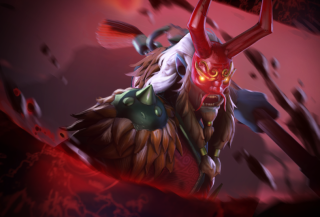 "Chosen to serve as an arcane guardian of his people, Grimstroke was instead responsible for their eternal corruption," states the news update on the official Dota 2 website. "Trapped in agony as inky revenants, his former kindred cast cruel shadows of what might have been. But the sacrifice infused Grimstroke with great power, and he considers it a price well paid." Grimstroke's abilities include: Stroke of Fate, which paints a path of ink with his brush, damaging and slowing enemies in its wake; Phantom's Embrace which commands a phantom to latch onto his enemy, damaging and silencing it; Ink Swell which covers Grimstroke or an ally in ink, silencing the target while granting bonus speed and immunity to attacks; and Soulbind, which binds an enemy hero to its nearest allied hero in range, preventing each from moving away from the other. For more on all things Grimstroke, including his suitably grim (sorry) backstory, head over to the official character page. Gabe Newell has arrived in Dota 2 in the form of a new deadpan voice pack, with lines including: "Please email me at GabeN@valvesoftware.com and let me know about your rampage".